Tickets on sale now from Kelowna Tickets! Global Music Fest is part of the month long Global Citizen events taking place in Kelowna and Lake Country, whose mission is to entertain, educate and inspire to action. Global Music Fest is a fun way for our community to engage with the United Nations Sustainability Goals and foster community locally around global challenges. Cultural and globally minded activities, including the Global Marketplace featuring the projects of this years Global Sustainability Challenge teams, will be held in the foyer from 6:15 to 8:45 pm. The main stage music begins at 7:15pm. 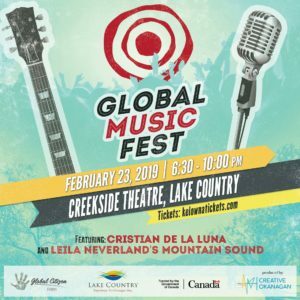 Global Music Fest will feature music by Cristian De La Luna, originally from Columbia and now residing in Edmonton, playing Latin rhythms with his four piece band. This band was a hit of October’s BreakOut West festival and winner of the Edmonton Music Awards Latin Recording of the Year in 2018. The Okanagan’s own upbeat heavy neo-soul group Leila Neverland’s Mountain Sound will open the stage component of the festival. Creative Okanagan is proud to be producing this event for Global Citizen Events. This project is partially funded by the Government of Canada and the District of Lake Country.